Gannon University athletics had a few memorable events over the past week, most notably in the areas of women’s soccer, men’s water polo and cross country. The women’s soccer team received a sixth-seed bid to the NCAA Division II Tournament Monday evening, the men’s water polo team battled in the Mid-Atlantic Western Region Championships (MAWPC) and the men’s and women’s cross country teams competed in the NCAA Division II Atlantic Regionals. The women’s soccer team will take on West Virginia Wesleyan at 2 p.m. Friday at East Stroudsburg University in the Atlantic Regional tournament. The winner of that game will go on to play at 2 p.m. Sunday against regional host East Stroudsburg. 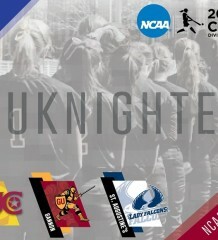 The Knights (13-4-2) reached the semifinals of the Pennsylvania State Athletic Conference tournament, but fell, 2-1, to West Chester Thursday. After a scoreless first half, Gannon redshirt senior Sarah Kaiser broke the tie with a goal for the Knights in the 55th minute of play, with Taylor Lewis earning the assist. But West Chester answered a little more than two minutes later to tie the score on Jenny Bail’s goal, and with just 3 minutes, 26 seconds to play, Linzi Wolfe scored the game-winning goal for West Chester. 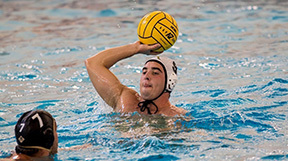 The men’s water polo team swept the MAWPC’s by beating Washington and Jefferson College, 17-2, La Salle University, 12-9, and Mercyhurst 15-10. Along with the three wins, redshirt junior Zarko Sadikovic was named MAWPC-West Region MVP and he was also named to the West Region’s first team. Coach Sean Morphy also earned honors for the second season in a row as he was named MAWPC-West Region Coach of the Year. Sadikovic has collected 53 goals and 11 assists so far on the season. Junior Brett Rehrer earned first-team honors after making 277 saves and compiling a 17-6 record in goal in 23 matches. Senior Nick Williams also was selected to the first team with Sadikovic and Rehrer. Williams ranks first on the team in goals with 57 and drawn exclusions with 35. He also earned MAWPC-West Region First Team All-Tournament honors alongside earning MAWPC Division II all-tournament honors this season. The Knights, 17-6 overall, will next see action Nov. 17-19 in the MAWPC Championships at Annapolis, Md. The seventh-seeded Knights will take on No. 2 seed George Washington in the opening round of tournament play. The men’s and women’s cross country teams traveled to Lock Haven University Saturday for their last meet of the season — the NCAA Division II Atlantic Regional. The men’s team placed ninth out of 19 teams – the Knights’ best finish in the Atlantic Regional meet — and the women’s team placed 16th out of 22 teams. Leading the charge for the Knights was sophomore Joseph Westrick, who finished 19th with a time of 32 minutes, 4.1 seconds in the 10K. Westrick earned all-region first-team status after he finished with the best time in program history. Freshman Meredith Morse posted the best time for Gannon in the women’s 6K event as she finished in 44th place among 151 runners with a time of 22:45.2.